NEW! What is the Difference Between Inrush Current and Maximum Allowable Inrush Current? Inrush current is the maximum instantaneous input current drawn when electrical power is switched on to many types of devices. For our purposes in providing an answer to this question, maximum allowable inrush current is usually determined by a component in the series circuit that might incur detrimental effects from the inrush current. This could be a fuse or circuit breaker. Or, it could be the maximum current rating of a bridge rectifier that must be protected from overcurrent. The maximum allowable inrush current value in amps is used to calculate the zero-power resistance of a thermistor inrush current limiter. The additional series resistance of the inrush current limiter, present at the moment power is turned on, mitigates the inrush current. As a result, the reduced inrush current does not fault the fuse or circuit breaker, or damage a component, such as the bridge rectifier noted above. Passive or Active Protection for Inrush Current? There are several component options for inrush current limiting. The two most common alternatives are the use of NTC (Negative Temperature Coefficient) thermistors or various forms of active circuits. However, the most appropriate inrush current suppression technique for a particular application depends on component pricing issues, the equipment’s power level, and the frequency at which the equipment is likely to be exposed to inrush currents. No single component solution can be best for every application. Each approach has its own advantages and disadvantages. What is an Inrush Current Limiting Thermistor (Surge Limiter)? Inrush Current Limiters are among the most common design options used in switching power supplies to prevent damage caused by inrush current surges. A thermistor is a thermally-sensitive resistor with a resistance that changes significantly and predictably as a result of temperature changes. The resistance of a Surge Limiting Thermistor decreases as its temperature increases. As the inrush current limiter self-heats, the current begins to flow through it. Its resistance begins to drop and a relatively small current flow charges the capacitors in the power supply. After the capacitors in the power supply become charged, the self heated inrush current limiter offers little resistance in the circuit. So low that the voltage drop is an insignificant factor with respect to the total voltage drop of the circuit. What Types of Inrush Current Limiting Thermistors are Available? Inrush current limiters are available in a wide range of initial resistance levels and current carrying capabilities. Ametherm produces inrush current limiters ranging from .2 to 220 ohms of initial resistance. Some designs are rated for less than one ampere while other are rated for up to 36 amperes. Are NTC Thermistors Common for Inrush Current Protection? A recent industry study, conducted by Data and Strategies Group, Inc., Framingham, MA, indicates that NTC thermistors are overwhelmingly the most popular type of device for inrush current suppression for power supplies. DSG’s research indicates that NTC thermistors currently comprise more than 90% of the market for components for this purpose. What Is the Cool Down Time of an Inrush Current Limiter? Because inrush current limiters heat after they suppress inrush currents, these devices require a cool-down time after power is removed. This cool-down or “recovery” time allows the resistance of the NTC thermistor to increase sufficiently to provide the required inrush current suppression the next time it is needed. An NTC’s cool-down time varies according to the particular device, its mounting method and the ambient temperature.The typical cool-down time is roughly one minute. 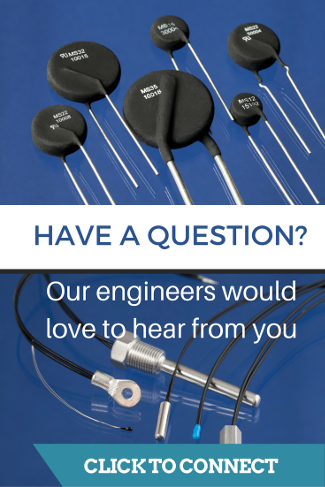 What Are Other Uses of NTC Thermistors? NTCs are used for many other applications as well. Besides their usefulness in inrush current suppression, NTC thermistors’ accurate temperature response, high stability, and excellent reliability are well-suited to many other areas of electronic design. For example, they are often used in applications such as temperature measurement, temperature control, temperature compensation, voltage regulation, air-flow and liquid level sensing, and in creating time delay circuits. One advantage NTC thermistors have over active circuits for inrush current suppression is lower component costs. Inrush current limiters are typically less expensive than active circuit components. However, the exact cost of each component depends on the power level of the power supply for which it is intended. Typically, the higher the power level, the larger and more costly the component. The cost advantage of inrush current limiters over active circuits can easily be illustrated with the following example based on a 300 W power supply. To provide inrush surge protection with inrush current limiters, the only components needed are two inrush current limiters, at a total cost of $.80 or less for both thermistors. A second inrush current limiter advantage is a simpler design. Because inrush current limiter-based surge suppression circuits designs typically involve fewer components, they are less complex than those involving active circuits. In turn, a simpler design reduces the time needed to design the inrush current suppression capability of the power supply. As a general rule of thumb, using inrush current limiters for inrush current suppression requires only about one-fifth the time needed to design a comparable active circuit. Also, the inrush current limiter design provides greater manufacturing simplicity and lower reject rates. Fewer components means fewer assembly steps. A lower component count also decreases the potential for manufacturing rejects as a result of defective components. Inrush current limiter-based surge suppression designs typically require significantly less space on the power supply circuit board than active circuits. For applications where the space available is at a premium, this can be a critical consideration.The failure mode when using an active circuit with a resistor usually requires component replacement. However, inrush current limiter-based in-rush surge suppression is self-protecting in the failure mode, because their resistance drops as temperature increases. As mentioned previously, various types of “active” circuits are sometimes used as alternatives to NTC thermistors (inrush current limiters) for certain applications. These component alternatives include triacs, resistors, and thyristors. An active circuit alternative is a triac (typically priced at about $1.00 for a 300 W power supply), plus a resistor (about $.60), plus the circuit needed to drive the triac ($.20 or more) for a total of $1.80.Despite the economic and design simplicity advantages inrush current limiters offer for inrush current suppression, there are some situations when an active circuit might provide a more appropriate solution. For example, active circuits can sometimes be a better choice than inrush current limiters when “hot restart” capabilities are critical. The advantage is related to the cool down/recovery time required for the resistance of the inrush current limiter to increase sufficiently to provide the required level of inrush current protection. If the power drops out for a period shorter than the specified recovery time, say, for a few seconds, the thermistor will not have an opportunity to cool down and return to its initial level of resistance. When the power comes back on, the resistance is too low to provide sufficient inrush protection, so circuits could be damaged, fuses blown, etc. Active circuits offer lower power dissipation than inrush current limiters at higher power ratings (typically those above 300 W). Because these designs typically run much cooler than NTCs, their heat dissipation/heat sinking requirements are less. There is a design technique engineers can employ to eliminate the problems posed by the cool-down/recovery time required for inrush current limiters to return to their initial level of resistance. Essentially, this involves designing inrush current protection to drop the inrush current limiters out of the circuit after they have performed their function. By removing them from the circuit once the initial surge has passed, the thermistors have an opportunity to cool down, so they are ready to respond to a subsequent surge after a power drop-out occurs. This technique requires the addition of either a relay or a triac in parallel with the inrush current limiter, plus the circuits necessary to control it. All the components of the protection circuit would be in series with the input to the line. Once the inrush current has been absorbed by the thermistor, then either the triac starts firing or the relay closes. The simplest method of powering these components is from the power supply itself. Once the power supply starts, it closes the relay or fires the triac, dropping the thermistor out of the circuit and allowing it to cool down and regain its initial resistance, so it’s ready to provide inrush current protection.